In order to feed a hungry planet, future agriculturists have to think outside the box. For some students, this means working inside the AgroBox. When you walk into a classroom at Bryan High School’s Urban Agriculture Academy, you see a typical teacher’s room. A bulletin board holds announcements and school notices. Bookcases are scattered around the room with resources and references for research papers. The loud sounds of lockers opening and closing fill the hallways between classes. It isn’t until you walk behind the school, in the middle of Omaha, Neb., that you see what turns a great agricultural education program into an innovative high school experience. 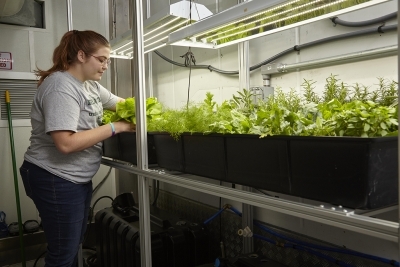 Samantha Hernandez inspects lettuce grown in the nutrient film technique (NFT) hydroponic system. Turning the corner around the back of the building, you are greeted by an imposing 40-foot-long shipping container with murals painted on the sides. Once you pull open the doors of the container, you find it’s been completely refurbished to contain state-of-the-art equipment for growing lettuce, tomatoes and various herbs using hydroponics. This facility is known as the AgroBox, and it can produce up to 1 acre of fruits and vegetables in the space of six standard parking spaces. The AgroBox won favor over a greenhouse, as it is a non-permanent, modular structure. The building can be loaded up and moved to a different location if needed. Once the idea for the agricultural education shipping container was formed, the school contacted Rubicon Agriculture, a manufacturing company based in Indiana, to make a game plan for creating the facility. Chris Moorman, an owner of Rubicon Agriculture, was a former FFA member and saw incredible potential in the project. After building plans were in place, the school secured funding from the Omaha School Foundation, its Perkins budget (which provides funding for career and technical education), Farm Credit Services, and the Buffet Foundation to make this dream come alive. Joslyn Wildrick inspects herbs that were planted in the ebb and flow hydroponic system. 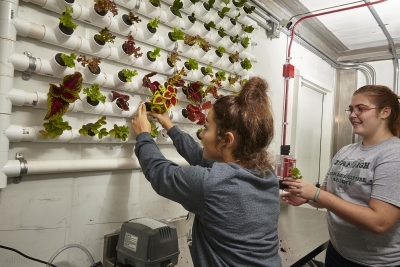 “Our focus has been to give students the experience of working in a greenhouse setting and also to learn what urban agriculture is all about,” Schindler says. When working in the hydroponics facility, students control the lighting, temperature, humidity and more. Making small changes allows the students to measure the impact that each of the variables has on the growth rates of plants. The school is set up in the career academy model, so students can then take this data into their science and math classes to measure and plot the data to make informed, science-based decisions for their projects. 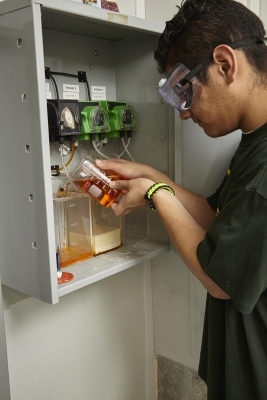 Kevin Salazar refills a nutrient tank, which can be programmed to dispense nutrient solutions in selectd quantities. The program has become increasingly popular. In the first year, 90 students were able to work in the AgroBox. Today, the Urban Agriculture and Natural Resources Career Academy enrolls 170 students. The program is highly selective and has to turn away nearly 40 percent of students who apply to be in the academy. Even still, Bryan High School supports one of the largest FFA chapters in the state of Nebraska with more than 100 active members. As agricultural education programs continue to expand and thrive in urban areas, it is becoming increasingly important for students to understand where their food comes from and how the entire food chain works. For many students in the Omaha school district, basic literacy on what food is and how it is grown may not always be available. 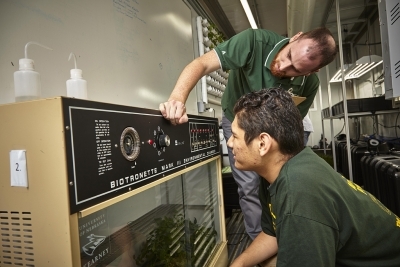 Schindler shows Kevin Salazar how to use a donated growing chamber in order to start plugs and plants for the hydroponic systems. As a part of this field trip, each student is required to select a favorite food and trace its path from the farm to the dinner table. For example, if a student chooses to study popcorn, he or she may visit a popcorn grower to see the crop in the field and learn how popcorn is harvested, processed, transported, and eventually how it ends up as a bag of kernels that can be cooked in the microwave. Kassie Ronnei and Joslyn Wildrick check on their cuttings. The students use the wall aeroponics system to clone and root plants. The AgroBox is just one example of innovative food-production facilities that can be used in urban communities to save resources and space and to provide locally grown produce. 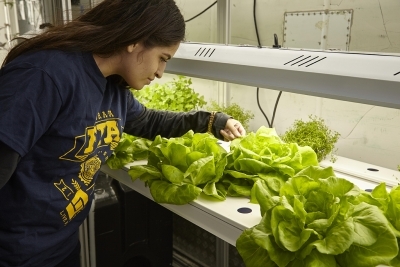 Learn more about Bryan High School, the Urban Agriculture and Natural Resources Career Academy and the AgroBox. When an agricultural education program is structured in the career academy model, students learn how foundations courses, such as algebra, biology and English, are used in the agriculture industry. From calculating feed ratios for cattle to developing agritourism business plans, all careers in agriculture require proficiency in reading, writing and arithmetic. At Bryan High School, freshman students make a career academy choice and take classes such as agricultural biology, agricultural economics, agricultural English, food science, agribusiness and agricultural American government during their sophomore, junior and senior years. This allows students and FFA members to see the connection between classes in a field they are interested in. Students working on a prepared public speaking leadership development event can receive support from their English teachers. Students studying for the farm business management contest can immediately use the skills learned in agricultural economics and American government when preparing for exams. In algebra classes, they can calculate parts-per-million formulas for various concentration and dilution ratios of plant products. Students who are putting together an agriscience fair presentation can gather feedback and advice from science teachers. Career academy models have shown an increase in student engagement, graduation rates and attendance across the country, according to the National Career Academy Coalition.